Founded in 1929 under the name of Union Airways, 1934 marks its actual birth: After it was taken over by the South African government, the airline was renamed South African Airways. 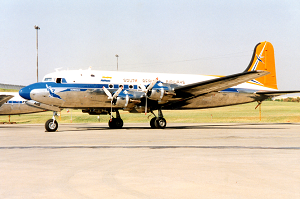 The very first intercontinental service, the legendary "Springbok Route", commenced in November 1945 and connected Johannesburg with Hurne-Bournemouth in England with stopovers in Nairobi, Khartoum, Cairo and Tripoli. Flight services from South Africa to Frankfurt were first introduced in 1952. In 2006 SAA became the first African airline to join Star Alliance, the largestglobal airline network. Today SAA is Africa's most awarded airline and connects the African continent with the rest of the world; the colours of its livery reflecting the "Rainbow Nation”. With a fleet of 48 aircraft, SAA carries about seven million passengers every year to 32 destinations worldwide.